milk + honey Everything Oil Roll On, 0.34 oz. 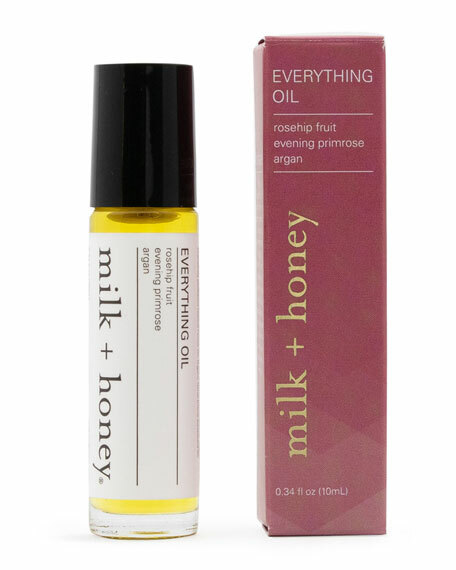 milk + honeyEverything Oil Roll On, 0.34 oz. Multitasker. This is the hardest-working oil around. Thanks to a potent concentration of organic rosehip fruit, evening primrose, and argan, this "everything" blend promotes healthy skin, removes makeup, nourishes cuticles, and can be used as a conditioning treatment for dry hair. Think of it as your very own beauty elixir and secret weapon in one. Apply a small amount to face, dry skin, cuticles, and around fingernails as needed in the AM or PM. Apply sparingly to dry hair. Use gently around eye area as makeup remover. 10.1 mL/ 0.34 fl. oz.